Your Tualatin Valley TU Chapter could use a couple of additional Board members. The job description is pretty simple. The Board meets monthly at 7 p.m. on the fourth Tuesday of each month (some months with no meetings needed) in the downstairs meeting room at the American Legion Hall in Tigard. Meetings usually last an hour or a bit more. TVTU has been quite successful in recent years, with projects such as the Christmas for Coho efforts and with good attendance at effective and entertaining Chapter meetings held most months at the Lucky Lab in Multnomah Village. But we can always use fresh energy and fresh ideas. If you are interested and would like to come to one of the Board meetings to test the water (barbless hooks only), please contact Mike Gentry at michaelgentry04@comcast.net or (503) 636-0061. This is a feel-good volunteer opportunity. I suspect I am singing to the choir. There probably isn't any fly tier who has not tried tying a pheasant tail - after all, it is one of the most productive nymphs ever to leave a vise. The fly has enjoyed uniform success on both lakes and rivers for decades. But I have found that a few tweaks can add a measure of improvement to this great deceiver and part of the fun of tying is to add a few twists to an old standard. Incorporating a hot pink beadhead and a bit of flash does seem to improve the hits. 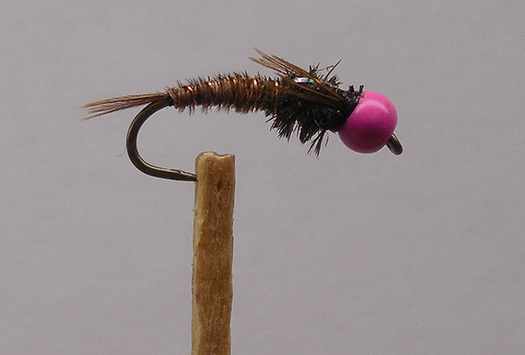 Beadhead: Hot pink bead, sized to match the hook. 1.Secure of beadhead by a number of wraps of thread behind the head, to create a ball of thread that can be pushed up against the back of the bead, securing the bend against the eye of the hook. 2. Feather the pheasant tail fibers out perpendicular to the tail feather shaft and select four or five long fibers, clipped off close to the shaft. 3. Tie in by the tips of the fibers (the tips will be the fly's tail) just short of the rear of the hook (to allow the body to have a bit of a downward bend) with two turns of thread, and gently bend the rest of the fibers to the side and out of the way. I make the tail about 1/3 the length of the fly. 4. Tie one end of about two inches of wire in with several turns right in front of where the tail is tied to the hook. 5. Wind the fibers to about 2/3 of the way to the back of the bead, to form the body. The winds should be snug but not tight; winding with too much tension will break some of the fibers. This will create a straight (uniform diameter) body and is easy; I like a tapered fly so before winding I build up a tapered underbody with wraps of thread. Tier's choice. In either case, before wrapping the fiber body leave the thread at the "front" of the desired body so the body wraps can be tied off. And for the larger flies, the first set of fibers may "run out" before the desired body length/thickness is reached. In that case, don't panic - just clip and tie in another bunch of fibers and keep wrapping. 6. Counterwrap the wire (wrapping in the opposite direction of the body wraps) and tie off at the front of the body. I give a #14 body about six wraps, evenly spaced. 7. Tie in a 1 inch piece of mylar or tinsel at the front of the body so that the piece is on top of the body and sticking backward. 8. Wrap a peacock herl thorax so that the thorax is slightly larger (thicker diameter) that the front of the body (takes several layers of wrap usually), and extends to the beadhead. Tie off with two turns at the beadhead. To improve the durability of the fly I wind the herl around the thread to make a herl "yarn" and then wind the yarn around the hook. 9. Pull the mylar or tinsel strip forward over the top of the thorax and tie off with two turns of thread at the back of the bead. Clip the remaining strip as close to the tie point as possible; I then push the little tag of strip back to double it over the tieoff thread. 10. Clip a clump of four or five tail fibers and tie the tips in on one side of the fly with two turns of thread at the back of the bead with the tips pointing backward for legs, so that the legs stick back a tad behind the thorax. Those turns of thread will go over the little double-backed tag of strip and help hold the flashback secure. Repeat on the other side. Since there will be little fiber ends where the leg fibers are clipped off in front of the tieoff points, I also gently double those ends back over the tieoff thread with my thumbnail or a bobbin, and put a wrap or two of thread over them to hide them and help hold the legs in place. 11. Tie off with several half hitches. This nymph must be a fair representation of a number of lake and river insects. On the lake I fish it like a chironomid, with fairly slow 4 inch or so retrieves. In the rivers it can be fished on a standard downstream drift. No serious fisherman can afford to be without a good supply of these flies.